Ayam Masak Lemak Cili Padi or Chicken in Coconut Cream with Birds Eye Chili in English, is a spicy rich yellow coconut gravy that is cooked with chilli padi. While this recipe uses chicken, it can be substituted with prawns, flower crabs or fishead. Depending on your tastebuds, you can add more or less chillies if you wish. Recipe for 4 pax. 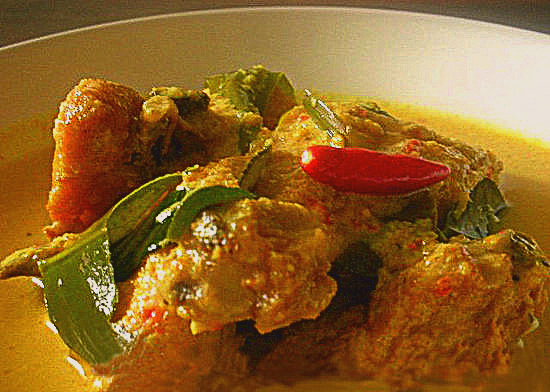 Other similar recipe – Ayam Kurma (Korma Chicken), Opor Ayam (Braised Chicken with white Sauce). Marinate chicken pieces with ginger, turmeric powder and salt for at least 30 minutes. Fry chicken until ¾ cooked and put aside. Finely blend rempah ingredients into paste. Using the same oil in pot, pour in the ground ingredients, torn tumeric leaf, kaffir lime leaves, lemongrass and fry till oil appear, fragrant (Medium heat – Do not burn). Add the fried chicken, coconute milk and water. At this stage, keep it to a simmer for the rempah to adsorb to chicken and until the gravy thickens. Once chicken is cooked, serve with steamed white rice. it is creamy and spicy. this is a classic example of singaporean malay cuisine. This chicken is awesome..creamy, spicy comforting dinner the whole family will love. Oh yeah! I love these and they’re really easy to make at home. This recipe is the one I will use from now on for my family dinner. I’ve never seen this before and I’m ever so tempted now. Can’t wait to try. This is the best recipe. I never use any other recipe. Short cut ones might ask you to ise tumeric powder for the gravy. But using fresh tumeric is a 100 times better. This is really really nice. Tried it and everyone loved it.